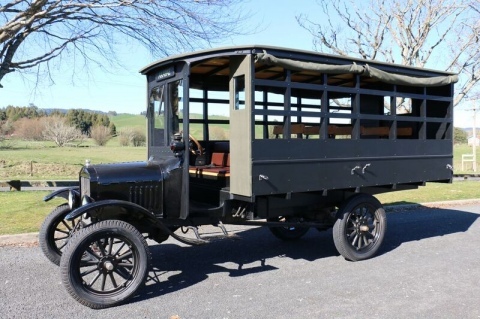 'Arapae', Piopio's replica vintage school bus has made a visit to Wellington where it was driven through the streets before being displayed at Parliament. The bus created considerable interest while on its journey. Unfortunately inclement weather meant the drive wasn't so pleasant for the passengers as the bus has no side windows leaving them rather exposed to the elements. Barbara Kuriger MP, a big supporter of the bus project welcomed trust members along with the Minister of Education, hon. Hekia Parata. Now the restoration is complete the Trust is focusing on raising sufficient funds to build a garage to house and display the bus in central Piopio.